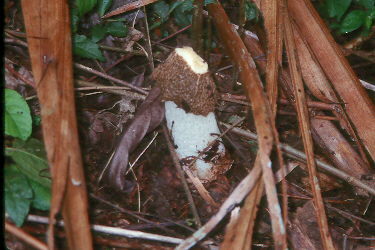 Stinkhorns, Dictyophora sp. 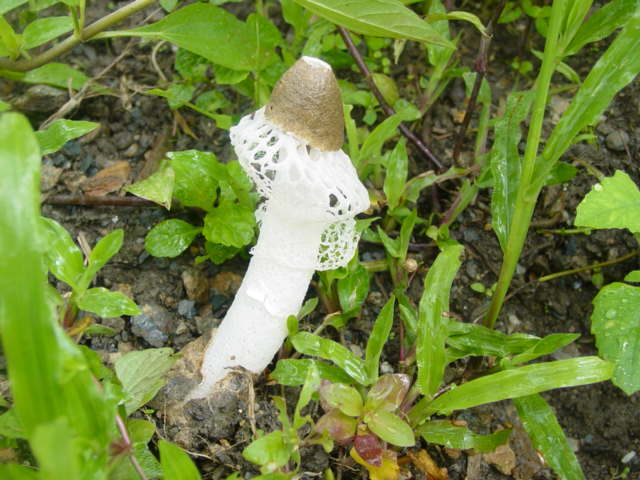 & Phallus sp. Photo by Bob Thomas, San Miguel Village, Toledo District, Belize, May 2004. Photo by Bob Thomas, Grande Riviere, Trinidad, November 2004. 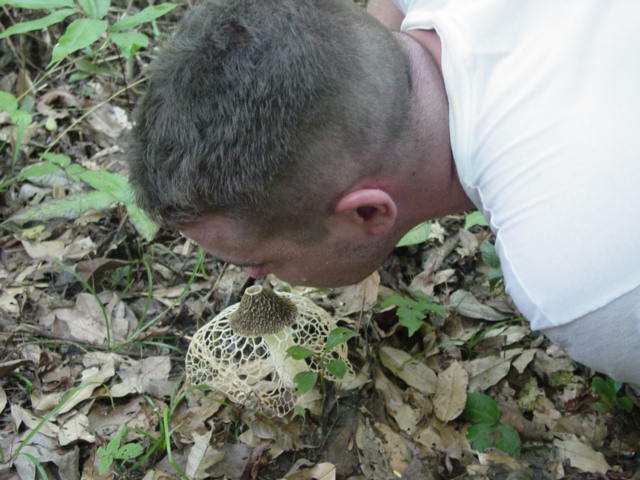 Photo by Bob Thomas, near Refugio Amazonas Lodge, Tambopata National Park, Peru, November 2007. Photo by Bob Thomas, San Miguel Village, Toledo District, Belize. Photo by Bob Thomas, San Miguel Village, Toledo District, Belize, May 2004. Mike smelling the putrid odor. Stinkhorns, belonging to the Family Phallaceae in the Order Phallales, are very interesting basidiomycete fungi that attract flies to distribute their spores. 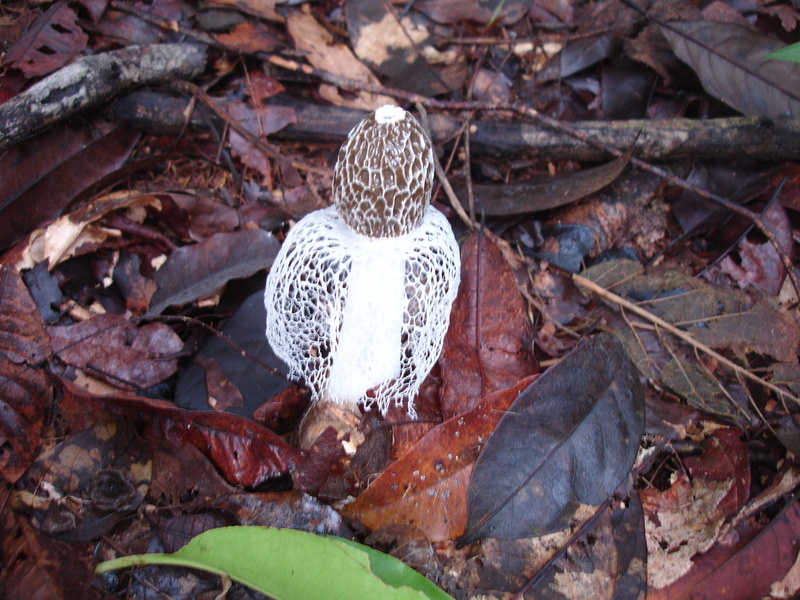 There is diversity in those found in the Neotropics (see our discussion of Clathrus crispus), with most having a soft hollow receptacle (the stalk), and a cap that has an obvious dark gleba (a rather slimy coating of spores that is odiferous). 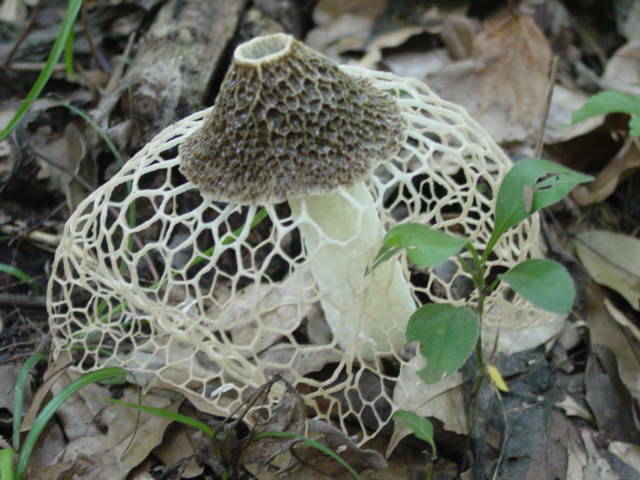 Two genera are encountered, each containing several species: Dictyophora, which at some stage of its development has a lacy indusium (the veil, that is at first elaborate, then wastes away over a couple of days) that drops downward from the cap, and Phallus, which has no indusium. They rapidly erupt from fruiting bodies underground that are reminiscent, in shape and texture, of boiled eggs. Of the photos above, those with veils are Dictyophora, and we believe the unveiled specimen is Phallus.